"Ash McKenna is my favorite kind of hero, a tough guy romantic with a smart mouth and a dark past." --Chelsea Cain The final book in Rob Hart's acclaimed Ash McKenna series shows that Ash can go home again...but it might cost him everything. 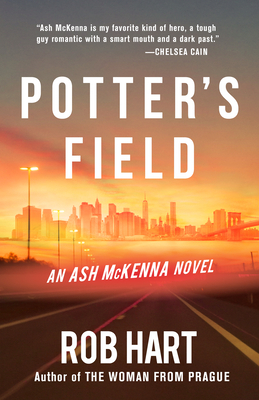 Amateur private investigator Ash McKenna is home. After more than a year on the road he's ready to face the demons he ran away from in New York City. And he's decided what he wants to do with his life: Become a private investigator, for real. Licensed and everything. No more working as a thug for hire. But within moments of stepping off the plane, Ginny Tonic, the drag queen crime lord who once employed him--and then tried to have him killed--asks to see him. One of her newest drag queen soldiers has gone missing, and Ginny suspects she's been ensnared by the burgeoning heroin scene on Staten Island. Ginny wants Ash to find her. Because he's the best, and because he knows Staten Island, his home borough. Ash is hesitant--but Ginny's offer of $10,000 is enough to get him on his feet. And the thought of a lost kid and a bereft family is too much for him to bear. He accepts, and quickly learns there's something much bigger at play. Some very dangerous people are vying for control of the heroin trade on Staten Island, which is recording the highest rate of overdose deaths in the city. As Ash navigates deadly terrain, he find his most dangerous adversary might be his own past. Because those demons he ran away from have been waiting for him to come back. Rob Hart is the author of four acclaimed previous Ash McKenna novels: NEW YORKED, CITY OF ROSE, SOUTH VILLAGE, and THE WOMAN FROM PRAGUE. His short stories have appeared in publications like Shotgun Honey, Thuglit, Needle, Helix Literary Magazine, and Joyland. He has received both a Derringer Award nomination and honorable mention in The Best American Mystery Stories 2015. His non-fiction articles have been featured at LitReactor, Salon, The Daily Beast, The Good Men Project, Birth.Movies.Death., the Powell's bookstore blog, and Nailed. He lives in New York City. Find him online at @robwhart and www.robwhart.com.